Trump condemned the shooting on Friday, but when asked if he believes white nationalist terrorism and violence is a rising concern globally, the president said, "I don't really"
In this April 18, 2018, file photo, Office of Management and Budget Director Mick Mulvaney testifies during a House Appropriations Committee hearing on Capitol Hill in Washington, DC. 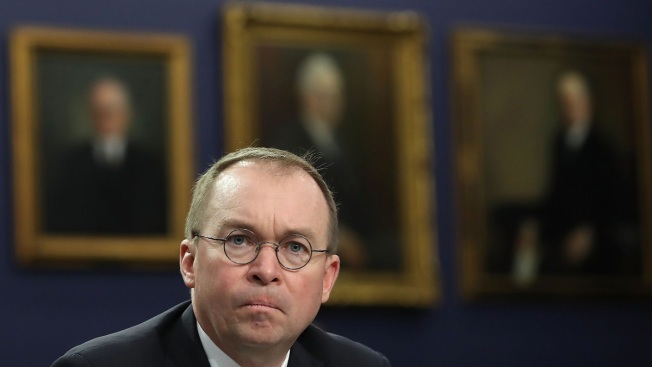 Acting White House chief of staff Mick Mulvaney said Sunday that the New Zealand mosque massacre, where a white supremacist allegedly killed 50 people, had nothing to do with President Donald Trump's rhetoric and that the president "is not a white supremacist," NBC News reports. On CBS's "Face the Nation," Mulvaney said Trump "is no more to blame for what happened in New Zealand than Mark Zuckerberg is because he created Facebook." The social networking site said it removed 1.5 million videos of the shooting within 24 hours of the attack. Trump condemned the shooting on Friday, but when asked if he believes white nationalist terrorism and violence is a rising concern globally, the president said, "I don't really." Trump added that he thinks "it's a small group of people that have very, very serious problems."